An astonishing untold story from America’s past—a sweeping, powerful, and necessary work of history that reads like Gone with the Wind for the Cherokee. 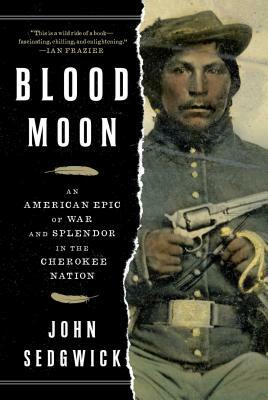 Blood Moon is the story of the century-long blood feud between two rival Cherokee chiefs from the early years of the United States through the infamous Trail of Tears and into the Civil War. The two men’s mutual hatred, while little remembered today, shaped the tragic history of the tribe far more than anyone, even the reviled President Andrew Jackson, ever did. Their enmity would lead to war, forced removal from their homeland, and the devastation of a once-proud nation. It begins in the years after America wins its independence, when the Cherokee rule expansive lands of the Southeast that encompass eight present-day states. With its own government, language, newspapers, and religious traditions, it is one of the most culturally and socially advanced Native American tribes in history. But over time this harmony is disrupted by white settlers who grow more invasive in both number and attitude. In the midst of this rising conflict, two rival Cherokee chiefs, different in every conceivable way, emerge to fight for control of their people’s destiny. One of the men, known as The Ridge—short for He Who Walks on Mountaintops—is a fearsome warrior who speaks no English but whose exploits on the battlefield are legendary. The other, John Ross, is descended from Scottish traders and looks like one: a pale, unimposing half-pint who wears modern clothes and speaks not a word of Cherokee. At first, the two men are friends and allies. To protect their sacred landholdings from white encroachment, they negotiate with almost every American president from George Washington through Abraham Lincoln. But as the threat to their land and their people grows more dire, they break with each other on the subject of removal, breeding a hatred that will lead to a bloody civil war within the Cherokee Nation, the tragedy and heartbreak of the Trail of Tears, and finally, the two factions battling each other on opposite sides of the US Civil War. Through the eyes of these two primary characters, John Sedgwick restores the Cherokee to their rightful place in American history in a dramatic saga of land, pride, honor, and loss that informs much of the country’s mythic past today. It is a story populated with heroes and scoundrels of all varieties—missionaries, gold prospectors, linguists, journalists, land thieves, schoolteachers, politicians, and more. And at the center of it all are two proud men, Ross and Ridge, locked in a life-or-death struggle for the survival of their people. This propulsive narrative, fueled by meticulous research in contemporary diaries and journals, newspaper reports, and eyewitness accounts—and Sedgwick’s own extensive travels within Cherokee lands from the Southeast to Oklahoma—brings two towering figures back to life with reverence, texture, and humanity. The result is a richly evocative portrait of the Cherokee that is destined to become the defining book on this extraordinary people. John Sedgwick is the bestselling author of thirteen books, including Blood Moon; War of Two, his acclaimed account of the duel between Hamilton and Burr; two novels; and the family memoir In My Blood. A longtime contributor to GQ, Newsweek, Vanity Fair, and The Atlantic, he wrote the first national expose of the exploits of Whitey Bulger in GQ in 1992.